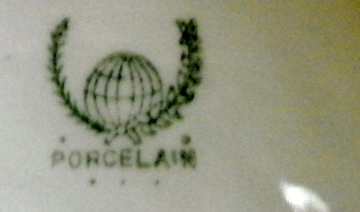 Pottery Mark Query - Laurel Wreath on either side of a globe. I purchased this porcelain bowl at a local Goodwill store.The bowl measures 15.5 inches wide, by 4.5 inches deep. Inside the bowl are "hand" painted flowers in orange and they look like some type of trumpet flower. These trumpet flowers have small white flowers among them. The bowl itself is very heavy and is basically white. On the bottom of this bowl is a makers mark in green. It consists of what appears to be a laurel wreath on either side of a globe or world, and the wreaths or garland are tied with a bow. 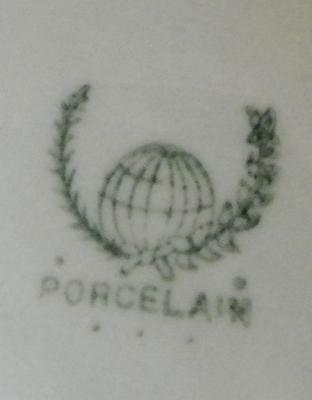 "Porcelain" is marked underneath it and there appears to be five dots underneath it. At first I though it might be a Minton bowl so I searched the internet and found some marks for Minton with the world or globe on them but they did not have the laurel wreaths on them. I did search the internet and so many different sites came up that it was overwhelming. 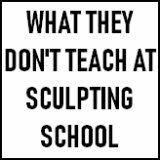 I tried narrowing it down by laurel wreaths then by globes by I had no luck. Perhaps this bowl is a wash bowl and maybe a pitcher goes with it. Because of its size and weight I believe it to be too large to be a serving bowl. No matter what it is a nice looking piece of porcelain. I'm not an expert, but I can look things up in my books (see right column) and make some educated deductions. I looked up the Minton marks with globe and laurel leaf. The globe mark had been used for a while, but the laurel leaf came in in 1912 and was used as the standard mark until 1950 when a revised standard mark without the globe, but still featuring a laurel leaf surround, was designed. It may be that your item is from the same era of the first part of the 20th century, but is from a smaller (or less prestigious) maker paying 'homage' to the great and important Minton factory by copying its famous markings - wanting to reflect in some of the Minton glory, so to speak - getting close to their mark but not so close as to get taken to court. Minton did do many variations of their marks, not all of which are shown in my Goddens, but for me, it is unlikely that Mintons would make stuff in the 20th century without putting their prestigious name on the backstamp. Anyone with more info please post. Comments for Pottery Mark Query - Laurel Wreath on either side of a globe. I have a thin, cracked chamber pot with just such a mark with "porcelain" beneath. It resembles the Burford mark but without the Burford name. 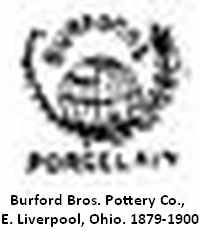 Burford Bros. sold out to the Standard Pottery Co. in about 1904. Could this be a transistion back stamp but without the Burford name? Looks to be Burford's Pottery. They made all kinds if bath acrutiments. Washbowls, powder etc. Buford's was in Ohio. Mark is from about 1879-1904 ? Annie, you are a star, I appreciate you sharing. Yet another mystery mark solved because of my wonderful site visitors. 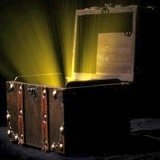 That's what this site is all about - each little victory mounting up to be a wonderful base of knowledge for internet searchers. I have a wash basin and pitcher with nearly the same markings, but nothing written above the globe. 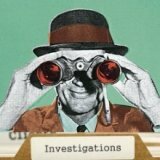 Is this still from that company? There are lots of wreath marks from various different makers, but if the graphics seems very similar in style, then yes, could likely be.